Thanks to Michael* at Boots Opticians for suggesting this comic. Apparently this is why none of the chairs in the shop have casters. *I have a terrible memory for names. I think he said Michael. 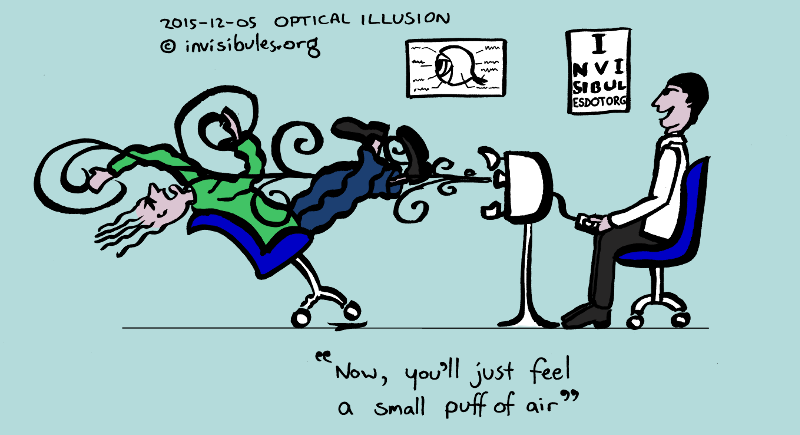 Optometrist at tonometry machine: Now, you'll just feel a small puff of air. When you get to “a certain age,” the op’s start checking your eye pressure with “just a little puff of air.” Aaarrrrgh! Good one! I’m giving a copy to my Optometrist! Wow, I’ve inspired art! That’s great. Thanks so much! Glad you approve — thanks Michael.